I’m not sure if you heard the news, but the citizens of Kansas City recently lost their minds. The Kansas City Royals won this year’s World Series against the New York Mets. With this victory came an epic flood of city-wide pride. It also came with a ticker-tape victory parade. Not to mention the 800,000 human-sea-of-blue-and-white clad fans who attended the post victory rally at Union Station. People were given the day off from work, schools closed so children could attend, and it felt as though every human being within city limits was in attendance. The city was alive. It was overflowing with love and cheer. The two days following the championship felt like one collective happy dream come true. It may seem silly to think that a baseball game could have such an grand effect on such a large population of people. Some say it was redemption after the Royals lost last year’s World Series. This year’s win was a comeback. Others say it’s the city’s sense of pride. They support their sporting teams on principle, win or lose. Some people say all that Kansas City has to offer is just that- their sporting teams. However, as an outsider who moved here a few years ago, I say it’s something far more valuable than sporting teams. Kansas City has a profound sense of community. Unlike any other city I’ve lived in. During the first few months of acclimation there was an undeniable sense that these people loved their city. People were not only nice, but cheerful (that is a Midwest trait). Even those that were less-than-friendly still stood by their roots and proclaimed their love of this place. At first it was annoying. Yes, I get it, you love Kansas City. More than the Pacific Northwest? Yes, they’d say. More than New York? Yes. It baffled me, but over time I became accustomed to their loyalty and even began to admire it. Kansas City began to feel like home with every acquaintance that became a good friend. Every small business owner who took a minute to say hello and asked my name. Each year that has passed has made me a little more proud to call this place home. Except, it wasn’t until this past week that I realized the real reason why. 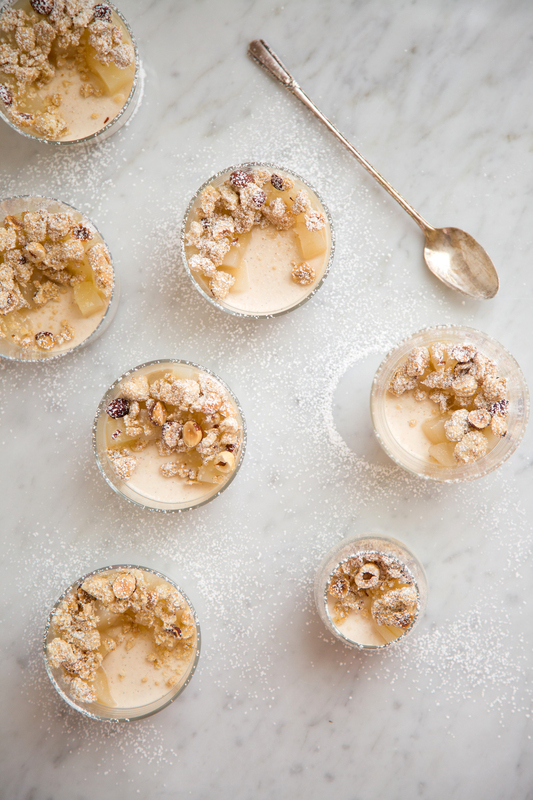 These Cinnamon Sheep Milk Yogurt Panna Cottas with Spiced Poached Pears and Hazelnut-Oat Streusel were inspired by the fall season in Kansas City. The locally produced Only Ewe yogurt, from Green Dirt Farm, is created from sheep’s milk which gives it a slightly sweeter note. 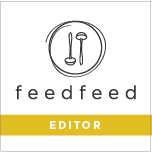 It’s rich and has a depth of flavor that’s reminiscent of Greek yogurt, but lighter on the tongue. 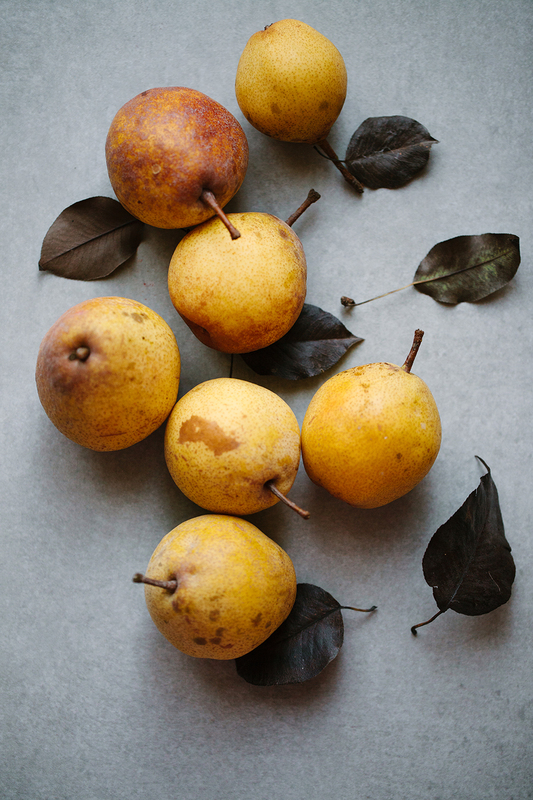 The pears are freshly picked by Trails West Farm and sourced from the Overland Park Farmers Market. They were firm and perfect for poaching with fall spices. 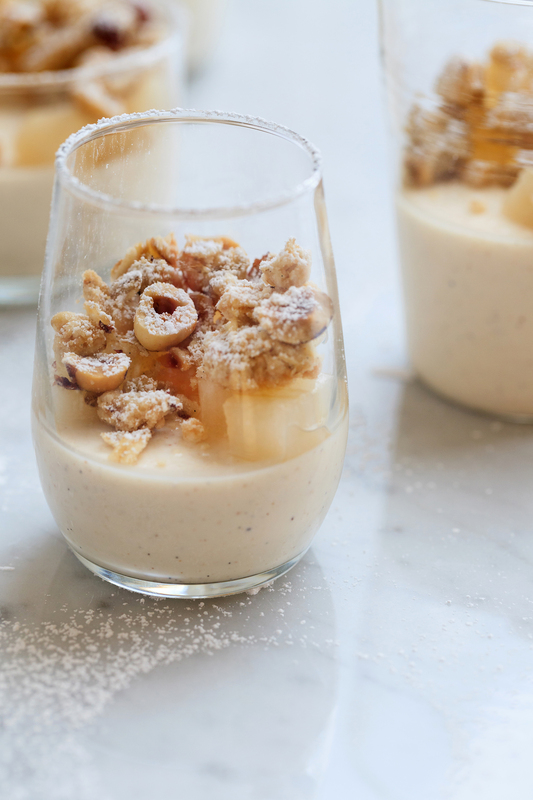 The holidays are only a few weeks away and these panna cottas would make for a lovely addition to the dessert menu. A lighter, but incredibly flavorful alternative to pie. It’s elegant, but still simple enough to make and not feel overwhelmed. All the components to this dessert can be made at least three days in advance and stored until ready to assemble. It’s warm, comforting, smooth, crunchy, chewy, and all the good things you want out of a small dessert. In a medium-saucepan combine heavy cream, milk, sugar, vanilla bean seeds & scraped pod, and cinnamon. Bring to a boil and remove from heat. Cover and steep for 10 minutes. Meanwhile, sprinkle gelatin evenly over cold water and let rest for 5 minutes. Gently warm the gelatin, over a double boiler or in the microwave- using 5 second intervals, until just dissolved. Do not overheat. Whisk dissolved gelatin into warm cream and strain into a clean bowl. Add yogurt and whisk until smooth. Transfer panna cotta to a liquid measuring cup, or use a ladle, and evenly distribute among glasses. Chill in the refrigerator until set, at least 8 hours and up to 24 hours. 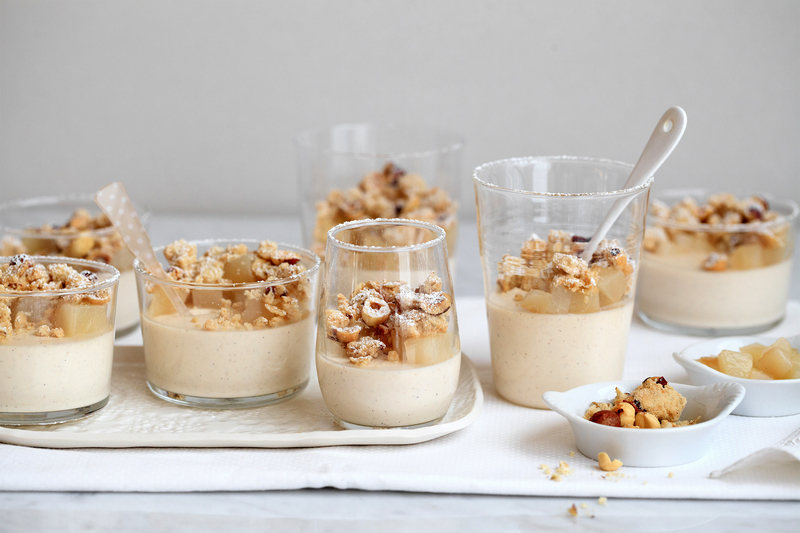 To assemble the panna cottas: Top with a large spoonful of diced spiced poached pears and a generous sprinkling of the hazelnut-oat streusel. Sift powdered sugar over the tops of the glasses and serve immediately. Cut a round of parchment paper, with the center cut out, to fit inside of large pot. Peel, quarter, and core pears. In a large pot, combine all ingredients except pears. Heat until sugar is dissolved and begins to simmer. Add pears and cover with parchment round. Continue to simmer, at a very low boil, for 15-20 minutes (depending on firmness of pears). Pears should be soft and easily pierced with a knife when done. Remove pot from heat and allow pears to cool in their liquid. Once cool, remove pears from liquid and dice into cubes. 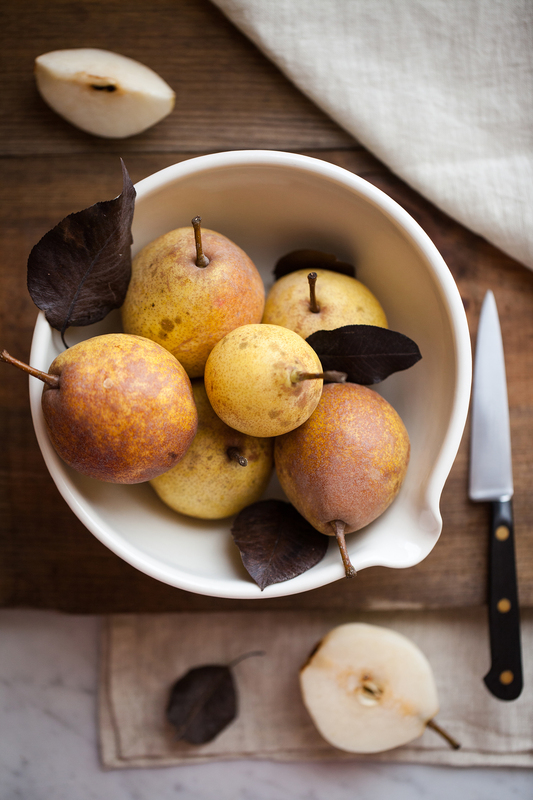 Store any leftover poached pears in their liquid in an airtight container and refrigerate for up to five days. Preheat the oven to 325F. Line a baking sheet with parchment paper or a Silpat. In a stand-mixer bowl, with a paddle attachment, combine sugar, flour, oats, vanilla bean, and fine sea salt. Add diced butter and mix on medium-low until dough becomes sandy in texture. 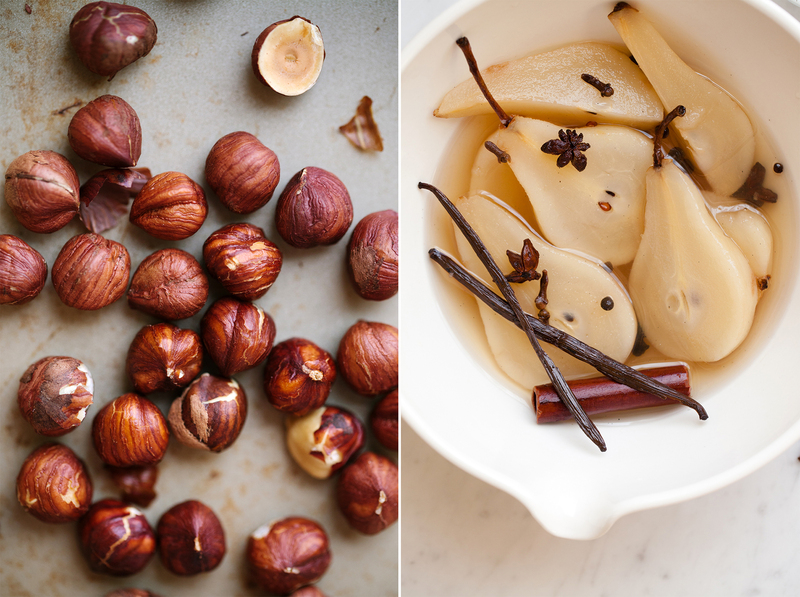 Remove bowl from mixer and add in hazelnuts; lightly mixing with your hands. Create small clumps of streusel dough by squeezing handfuls of the mixture with your fingers. Place streusel clumps onto a parchment-lined baking pan and place into oven. Bake for 30 minutes, stirring halfway through, until golden. Remove from oven and place on cooling rack to cool. Store streusel in an airtight container, at room temperature, until ready to use.